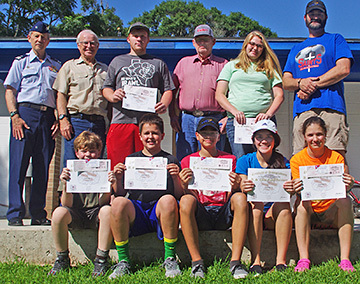 In an effort to promote boating safety for both adults and teenagers, the FOR San Bernard Environmental Committee hosted a U.S. Coast Guard Auxiiary boating safety course at the FOR Community Center on Sat May 28. This in-depth course gave the attendees the knowledge needed to obtain the necessary Texas certification. 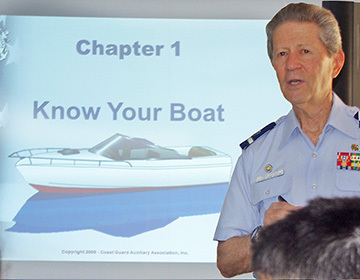 <<Fred Steves, Flotilla Commander 6-3, Seabrook, TX, assisted by USCG Auxiliarists Frank and Pat Muraglih taught the class. A total of nine students attended the class. Mandatory boating safety education certification is required for anyone born on or after September 1, 1993 to operate a vessel with a motor of more than 15 horsepower, a personal water craft (PWC - jet ski), or a wind-blown vessel measuring more than 14 feet in length. 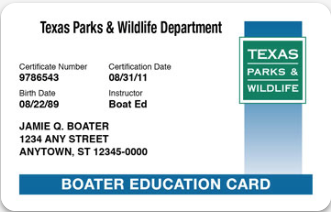 Certificate holders all received their Texas Boater Education Card. Note: While all boaters are encouraged to take boating safety education, those born before September 1, 1993, are exempt from required certification but take the class for review.